We do not use the same dollar sales figure for each store owned by a chain. Using Kroger as an example, we know that the sales of a Fred Meyer Store are significantly higher than the sales of a Jay C store. Therefore, it does not make sense to use the average sales per store of the total Kroger Company for each of these two widely different retail brands, and for all the other Kroger stores and Kroger brands. We include convenience store chains that have significant grocery volume: e.g. 7-Eleven, Circle K, Kroger's Kwik Shops and Turkey Hill Minit Markets. There are thousands of these stores, which collectively do billions of dollars in Grocery sales. We obtain information from a variety of sources, including, but not limited to retailers, wholesalers, the Internet, local market sources, trade associations, and trade media. We include 20 maps which show the precise location of all 399 metro areas, and we include an easy to use index which identifies the map location of each market. We list the source of television coverage for each metro/micro area. This provides an easy and logical way to evaluate the reach and effectiveness of local television advertising. The figures in this section are on an index basis and show how the market compares to the National Average on a per capita basis (U.S. average equals 100) for selected categories. The figures are projections from U.S. census figures and are provided for informational use only. They cannot be projected into accurate dollar sales figures for any metro area or TV market. 2019 was a year of acquisitions and will continue throughout 2020 at a rapid pace. The grocery Industry is running a race on technology, home delivery, pick up, healthy/dietary alternatives, advertising, apps, autonomous cars, etc. Most have it down to a science but many are still catching up. Ahold Delhaize acquired Stop and Shop which in turn acquired 32 stores from King Kullen Grocery Company, expanding Stop and Shop’s position in the Long Island, New York area. Sprouts are up 300+ stores in 2018, opened their first South Carolina store and entered 3 new states: Louisiana, New Jersey and Virginia. 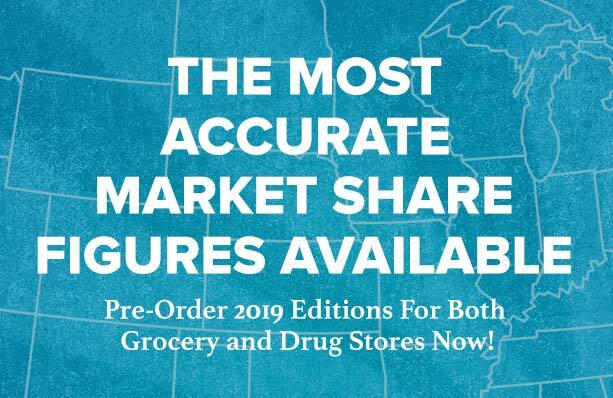 Couche Tard sold 192 Circle K Stores to Cross America Partners in return for equal value in the upper Midwest..
Lidl expanded to the Northeast with the acquisition of 27 Market Baskets in NY & NJ. They also opened their first 3 stores in the Atlantic area. Publix continues to open and acquire stores taking their total store count up to 1214 locations. Kroger, Mid-Atlantic decided to exit the highly competitive market in Raleigh-Durham market. The following list includes a very few of the significant changes that have occurred in the drug store industry in the past few months. Albertson’s and Rite Aid mutually agreed upon the terminate the agreement to merge. Albertson Company and Genomind have agreed to “Assay” partnering. Walgreens acquired Fred’s Pharmacy files and are converting into Walgreen pharmacies. Stater Brothers decided to sell Super RX Pharmacy to CVS in 22 locations. Kroger and Walgreen selected 13 Walgreen locations in North Kentucky to pilot format. HY-Vee acquired 22 Shopko Pharmacies in 17 cities.